"After meeting these unlikely partners one comes to the conclusion that the thing that is wrong with teamwork is conformity. The very diversity of this Barcelona group seems to be the guarantee of its success"
Sibyl Moholy-Nagy "In Barcelona, a modern tradition based on respect" en The Architectural Forum, New York, julio-agosto 1965. "L'arquitectura a Catalunya (1939-1970)” en L’Art Català Contemporani. Aymà, Barcelona, 1972. 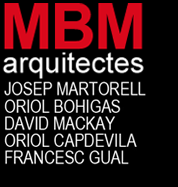 "MBM and the Barcelona School” en Martorell, Bohigas, Mackay: Arquitectura 1953-1978”. Xarait, Madrid, 1979. "MBM continua en su esfuerzo por lograr una síntesis que haga compatibles las nuevas propuestas figurativas con la persistencia de una antigua sensibilidad". en Arquitectura Española Contemporánea. G. Gili, Barcelona, 1984.